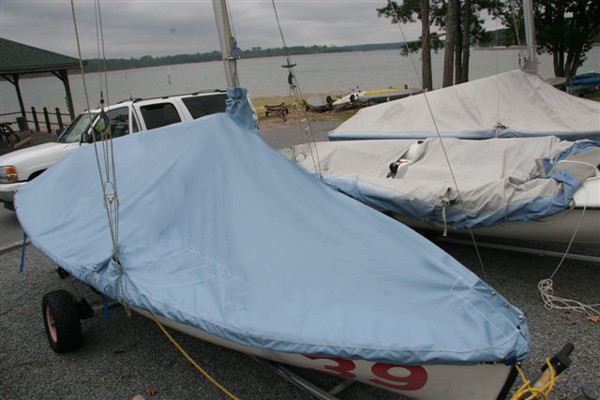 420 Mooring-Trailing-Mooring Cover -- One Design Sailboat Covers -- The Sailors Tailor, Inc. Hybrid of our Mooring cover and Trailing-Mooring cover. For mast up, this full deck cover fits over slanted boom sloping from the gooseneck at the mast down to a cushion resting on the back deck. For trailing or storage, slanted mast supports cover and gives it same pitch to shed rain water. Has heavy duty nylon zipper running from the mast to side stay and flap that snaps over zippers to protect zipper from damaging UV. Mast collar with draw cord closure. Flaps that snap around stays to protect chain plates from water seepage and shade deck from UV discoloring in the stay area. Fits with 5/16" elastic shock cord hem and tie-down points. Reinforcements at gooseneck just behind mast collar, at end of boom, over spinnaker cleats and pulleys, over all standard class protruding cleats and eyes, and the back corners of the boat.